When I was a kid, growing up in Illinois, I remember catching fireflies and putting them into a jar. I loved watching them flashing away at night. Later, I would let them out to live another day. cells, forming a 3.6v battery pack, rated at about 2000ma-hours. The solar panel was a ten cell 5v panel rated at about 160ma. I built a circuit board containing the driver circuit. I glued that board with an insulator board on top of the battery pack. I then soldered 20 flashing green LEDs to a long circuit board. Each LED contained its own flashing circuit. The flash rate was about 1Hz with a 50% duty cycle. I soldered a 1K resistor in series with each of the LEDs, to limit the LED current to 1ma of current. Such a current produced a nice bright green light. I shaped the leads of the LEDs in a random pattern inside the jar. 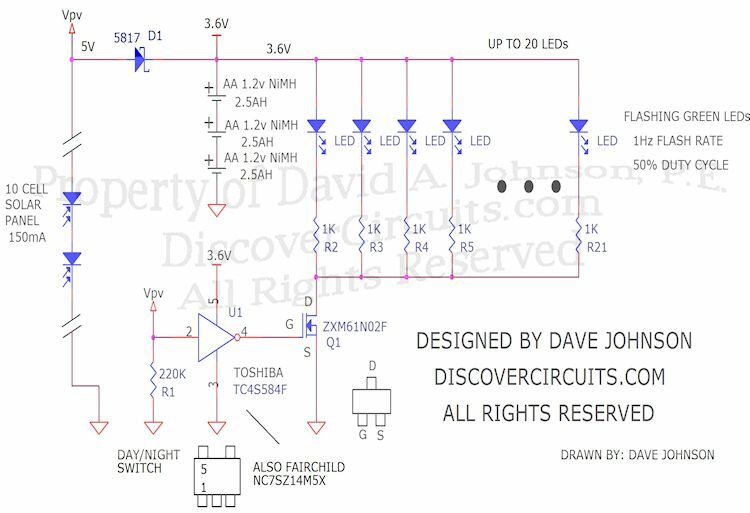 The drive circuit is fairly simple. A 1N5817 schottky diode between the solar panel and the battery pack prevents leakage current from the battery to the solar panel during night time. A low power Schmitt trigger inverter monitors the voltage across the solar panel and turns on an n-channel FET when the solar panel was no longer producing any current. The FET switches on the LEDs at night. When first turned on, all the LEDs will appear to be in sync. But, after a few minutes, they start flashing in a more random pattern. The result is a mason jar with lights which turn on and off randomly, simulating fireflies. Below is a short movie of the lights in action.